It's the battle that almost wasn't. After failing to win the Democratic Party's nomination for a school-board seat last year (he finished fifth in a race for four seats), Domingo Garcia intended to shelve his political ambitions for good. There's little doubt now that some in his party wish he'd stuck to that plan. This year, though, Garcia's running again, challenging the party's chosen candidate, Cynthia Elliott, in the September 14 primary. The race is revealing a party divided along the lines of political allegiance, race, and, of course, funding for the school district. In last year's bid, Garcia did well in eight of the city's 11 districts. But he failed to earn a nomination because, under party rules, each district's vote is weighted by its turnout in the last gubernatorial election. The three districts Garcia lost --- the 22nd, 25th, and 27th --- are in the heart of Rochester's black community, which voted in "insurmountable numbers" in 2002 to support former State Comptroller H. Carl McCall, Garcia says. Among the candidates who did get nominated was David Perez, who eventually won a seat. "I figured, well, you know, at least they got a Hispanic," recalls Garcia. "So I didn't run a primary against them then because I thought it doesn't make any sense." That changed when Perez --- the school board's only Hispanic --- stepped down after just a few months' service because he'd moved outside the city. And Garcia says that's when board members Rob Brown and Jim Bowers approached him about filling the seat Perez vacated. "They wanted to keep Hispanic representation on the school board," Garcia says. "Since I was the next person in line because of my votes, they decided I would be the logical appointee to fill David Perez's vacancy. Those were the only bases under which they decided to appoint me; there was no other motivation." But the appointment expires at the end of this year, and Garcia's board seat is on the ballot again this fall. And once again, the party passed him over, nominating Elliott. Garcia says Elliott won the nomination because she's backed by State Assemblyman David Gantt, who's feuding with the board, and wields increased power among Rochester Democrats. Gantt has been the focus of media attention, and school board anger, for holding up $20 million in state aid for the Rochester School District. He has also been organizing petition drives, and in some cases primary challenges, for committee slots in three city districts --- the 21st, 28th, and 29th, chaired by Maurice Verillo and County Legislators Carla Palumbo and Jose Cruz, respectively. Palumbo is managing Garcia's campaign, and Cruz supports his bid. The challenges are meant to send a message, Gantt says, about defying party protocol and not supporting its chosen candidate. He's also called for Garcia to step down from his position of party vice chairman. "If his job is to support the party and its candidates, how can you support the party and its candidates when Cynthia's the nominee and you're running a primary against her?" Gantt asks. "Ethically, he should have stepped down. It's a real conflict as far as I'm concerned." 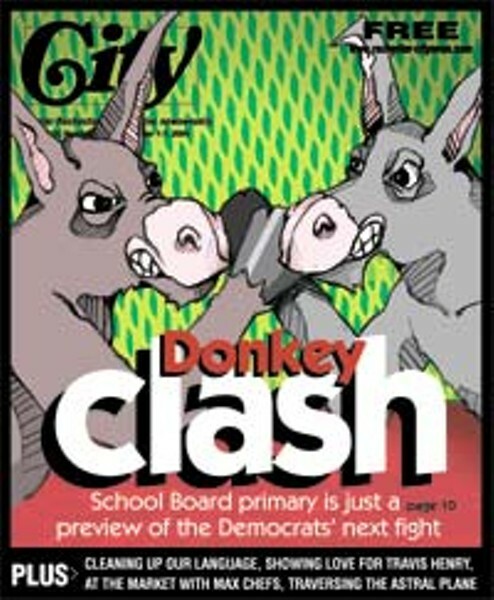 Individual committee primaries also carry undertones of the school-board feud. Ronnie Thomas (a county legislator and Cynthia Elliott's boss at the Baden Street Settlement) personally gathered petitions for candidates challenging board member Darryl Porter. Meanwhile, board member James Bowers collected signatures for a slate of candidates opposing the Gantt-backed candidates in the 21st legislative district committee. Race and ethnicity are also factors. "There are all these stresses and strains in the party, and some of it seems to break down along racial lines," says one party leader who asked not to be identified. "No doubt there are some people among the competing cliques who do think racially, whether they even realize it or not." Gantt says that last year, a group of black residents was barred from committee participation in the 21st district. "They put a rope up and they put those black people behind the rope," says Gantt. "I came out of the segregated South; that doesn't set well with me, neither is it something that we do here in Rochester." And Gantt says he only sought to fill vacant committee seats. "We felt we should make sure those people were represented in the political process," he says. He also thinks it's unfair that he's being criticized for a routine political practice. "If you go back and look at the rosters, there's nobody in those districts," he says. "Whose fault is it but theirs that they didn't organize their district?" But despite running candidates in the city's most heavily Hispanic districts, Gantt disputes the notion of a black-Hispanic divide in the city. "Every Hispanic who's gotten elected to office in this city since 1981, I played a major role in their election, both putting people on the street and also raising money for them. Every one," he says. "It has nothing to do with race. That's their excuse." The primaries were forced later, and not by him, he says: "The person who's behind this is Jim Bowers," Gantt says. Some party insiders say Bowers, who recently announced he doesn't plan to seek reelection to the school board, is considering a bid for the 21st district's county legislature seat now held by Chris Wilmot, who's term-limited. Bowers won't say whether he's thinking of that seat. "I don't know what I'm going to do," he says. He also hints that he might consider a bid for city council or an even higher office. But despite collecting signatures after Gantt's candidates had, Bowers says, Gantt's actions constitute a "hostile takeover." Bowers says Gantt never approached the district's leadership before launching the petition drives. That prompted Bowers to take action. "I wanted to keep this [legislative district] independent and out of that orbit," he says. "What we're trying to do in 21 is prevent bossism." Another explanation could be that Gantt simply wants to solidify support in a bid for Rochester mayor by City Councilman Wade Norwood in November, 2005. Many in the party believe Norwood could face a primary challenge, perhaps from one of the half-dozen term-limited Democratic county legislators. And the three district committees with primaries this fall could be those least certain to support Norwood next fall. Gantt doesn't deny that he has an eye to the future when it comes to Norwood's candidacy: "That's the democratic process," he says. Then there are the seats of those term-limited legislators themselves, though Gantt denies he's eyeing any of them. Some in the party expect to see Palumbo and Cruz face primaries in their own bids for reelection. Whoever wins the primary for school board, party observers say this race is just the opening salvo in a showdown between Democratic factions that's only going to get bigger and uglier. "I don't think there'll be a cease-fire until the at least the 2006 election," says one party insider. Registered Democrats living in the Rochester City School District can vote in the school board seat primary election between Garcia and Elliott at their usual polling places between noon and 9 p.m. September 14. Info: Monroe County Board of Elections, 428-4550. A profile of Domingo Garcia here! A profile of Cynthia Elliott here!